Spring has finally sprung in New England. 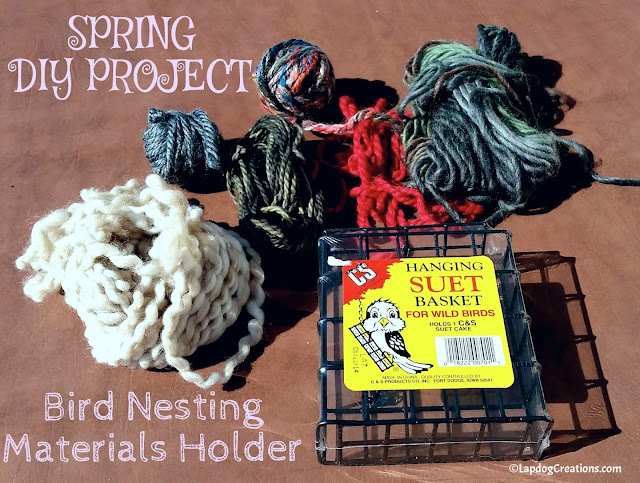 The birds are chirping away, and collecting debris to build their nests... so why not give them a hand? No, they don't want our help in the actual building. However, they do appreciate some assistance in the supply department. Sure, they can find lots of debris in our yards (grass, straw, dead twigs, dried leaves, etc. ), but we can give them a hand by making a Bird Nesting Materials Holder with scrap yarn. Plus, it's really fun to see bursts of color throughout their nests. Making your holder is quite simple, and will not take long at all. You can make one in under an hour, or you can spend a few hours making several for friends and family. It's also a great craft project to do with kids. 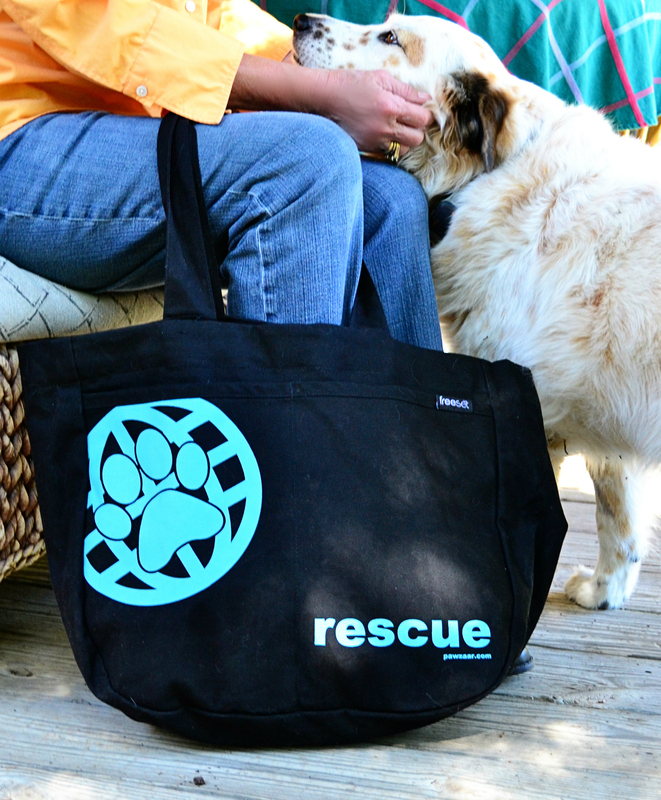 School or camp groups could do them as a take-home gift for Mom. You'll find basic ones at just about any store that carries bird feeders for $1-3 (some dollar stores even have them). I got mine at the pet feed store for $1.99. Next year I'm going to look for one that has a "roof" over it to help keep the yarn out of the rain. I'm a knitter, so I save my scraps all year long. If you don't knit or crochet, ask a friend or family member who does (we're a giving bunch and will happily pass some of our scraps your way). I've noticed our feathered friends prefer natural fibers (I completely agree with them), and different birds seem to be attracted to different colors. Once you have enough scraps cut, begin stuffing them into your suet basket. Don't pack them too tight - the birds need to be able to easily pull out the piece that is most appealing to them. Pull some of the scraps through the cage so they are dangling on the outside. This will help catch the birds attention as they blow in the wind. 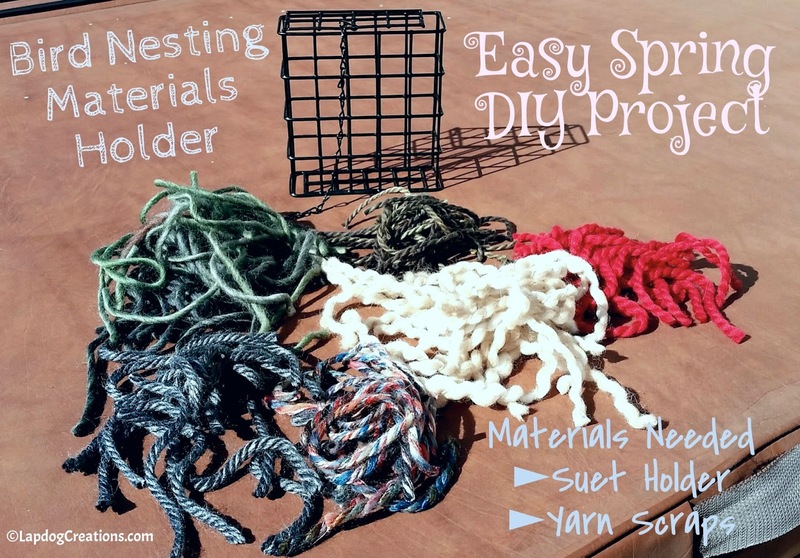 Hang the nesting materials holder from a tree, fence post or even the side of your raised deck. Just be sure it's in a spot where birds can easily get to it (if you let your pets out on your deck, that may not be the best spot). Suet holders come with a short chain for quick and easy hanging. That will work for many spots, however if you are hanging it from a thick tree limb (as I have), pick up some chain link at your local hardware store. Measure out how much you need, then use pliers to separate the links and secure it around the tree. 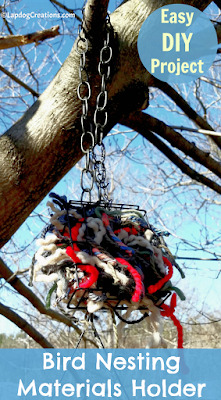 Attach the suet holder's chain to the chain link. Now, sit back and watch the birds get to work! 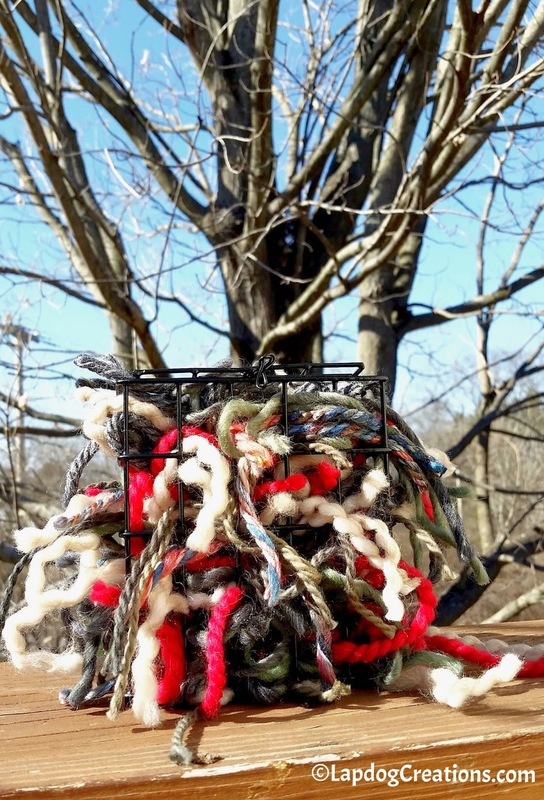 Hopefully in a few weeks time you'll start to see some of your colorful pieces of yarn intertwined into their nests. I can't tell you how giddy I get when I see pops of color in a nest. Be sure to look up and all around - you might be surprised just where you'll find a nest tucked away! We have them under our deck, and in the trees, both high and not-so-high. No time to make a nesting holder? Just leave a pile of your dog's fur brushings or clippings in a tree birds frequent. They'll scoop it up pretty quickly. Many years ago, I attempted to spin my own yarn. The spindle and I were not friends, which meant I had quite a bit of leftover fiber. This one happened by accident a few years ago. We discovered some bright blue spots in one of the nests under our deck. Upon a closer look (but not too close - do not disturb those nests! ), we realized the Robins helped themselves to a few shreds of an old tarp that was lying nearby. The last round of sweeping out the Spring Shedding (WHEN will it end?!) I put the drifts of mixed dog and cat fur in the tree out back for the birds, but it doesn't look like they've found it yet. This is an awesome DIY project...and I'm totally NOT a DIY guy! I love love love this! My Keeshond had perfect fur for nest building. She would blow her coat in the spring and I would scoop up the fur and put (some) of it outside. Birds really seemed to like it. I wonder if certain kinds or colors of yarn are better. I wonder if they prefer neutral colors so better hide the nest. Oh no, you stole my post. Oh well, I'll wait a couple weeks and post mine. I save yarn ends and floss ends plus dog hair. This is such a great IDEA. 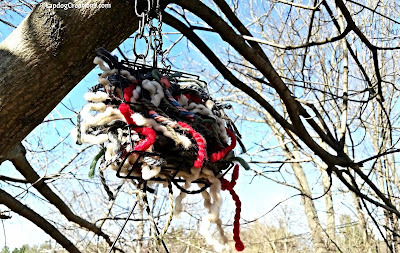 I'd love to see my materials woven into nests in our trees and it's so sweet to help provide nesting materials for all the birds. GREAT DIY project. What a cute idea! My mom has a lot of yarn scraps that I can steal from her to do this. This is so clever! I've seen birds use all kinds of stuff for their nests. Very cool! I don't use yarn enough to have a lot of yarn scraps but whenever one of my pets gets a haircut/brushed I always put the hair out for the birds. That is such a cool idea! I've never thought to do that before, we always just let the birds have whatever dog hair we brushed out but I like this so much more! How neat. We don't really have anyplace to hang one or I'd give it a try. I saw this on another blog recently and thought it was a brilliant idea! I really love this idea. We always leave the dogs' hair out for the birds. I've seen Basset and Westie hair in our birds' nest. BOL! This is such a cute idea! We don't have a lot of leftover yard in our house, but it makes for a colorful outside decoration. I saw you post this the other day on one of the social channels and I loved it! As a matter of fact, I have picked up a wire basket and am preparing to make one! It will go adorable with the rest of our bird feeders and bird bath! This is such a great idea! I have some dried flowers hanging on my front door and I just discovered a nest full of eggs in there. Sharing this!! Love this! I've made one with spare roving from spinning/needle felting. We made a basket that I wove to haven an opening that you can put the fiber into. It's fun to see the nests with pops of color in the birdhouses in our yard! I really do try DIY projects but I never seem to be able to get them quite right. This looks like a project even I could not mess up! Yay! We have so many birds in our area and I would love to get one of these up this season. Thanks for sharing! Love it! 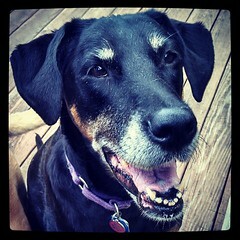 My pup Lucy and I were recently at my mom's house. I brushed the pup and left piles of fur in my mom's back yard. She was happy to know it wasn't just fur-litter but bird nest building material! 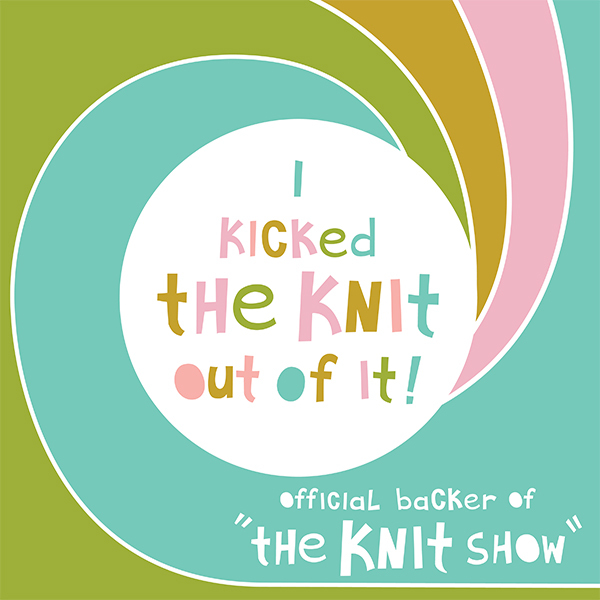 I'm a knitter too! I just bought a bird house and would love to help this winged lovelies build their own as well. Thank you for this post! I keep forgetting that I could put out some of the excess cat hair for birds to use for their nests. Using left over yarn is also an excellent idea. A sweet and simple project! Great idea, and fun activity to do with the family- Great use for yarn scraps. Well! Now, this is super cool!! Seems so simple, yet it's a very clever recycling project! What a very cool idea! Pinning! How interesting, you're sure to see some interesting nests soon! 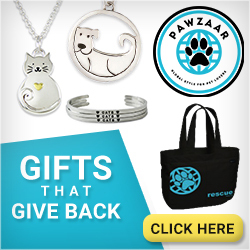 Thanks for upcycling and caring for the environment and the birds. 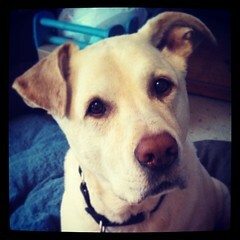 I am tweeting (no pun intended) for BlogPaws right now with this post. This is such a great idea! 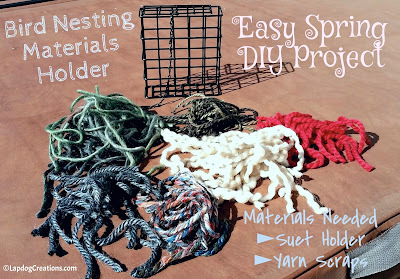 Every crafter has little scraps of things that could be used for a project like this. I wish that I had a place where I could put one of these (I live in a second-floor apartment). 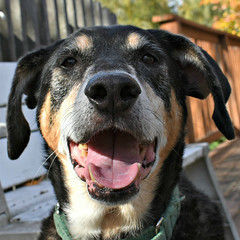 Manna would love to watch the birds come and take pieces for their nests! 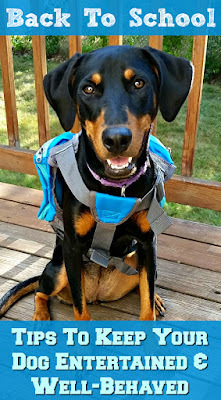 PepiSmartDog: what an awesome post! Love this and thank you for sharing. The birds will really appreciate this a lot. Woo Hoo! Thank you for joining our Thankful Thursday Blog Hop. We always love your posts. This is a really great idea! My mom likes to feed the birds, but they are so messy! Maybe this would be another way to encourage them to visit and not the mess. Thanks!